The group numbers 57, the city's toll last year from fatal opioid overdoses. Fifty-seven people spent nearly an hour of their Friday evening lying motionless on the cold stone plaza in front of Portland City Hall, trying to draw attention to the 57 people who died from drug overdoses in the city last year and efforts to make that number smaller. P.J. 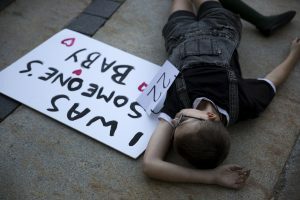 Lowry, 12, lies among a group of 57 people at an overdose prevention “die-in” outside Portland City Hall on Friday. P.J.’s mom, Merideth Norris, a physician and addiction specialist in Kennebunk, spoke at the event about a lack of access to evidence-based treatment. The somber display caught the attention of about two dozen people, who stopped to watch. One was Mariah Curtis, 26, of Portland, who said the sight of 57 people strewn across the sidewalk and City Hall steps confirmed her conviction that too many Mainers have died from overdoses and not enough is being done. 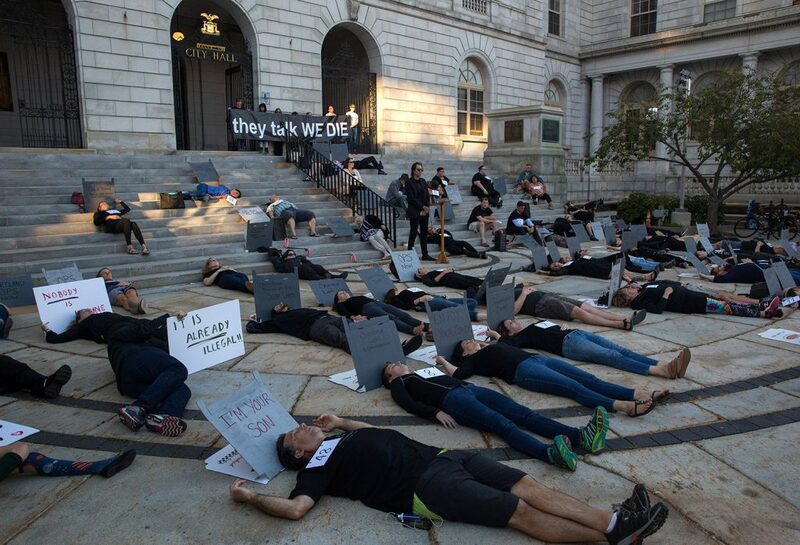 The overdose prevention “die-in” was held during one of the city’s monthly First Friday Art Walks, but City Hall is just far enough east on Congress Street that very few art walk patrons passed by. Organizers said they wanted to have the event at City Hall because its main purpose was to draw attention to a proposal to build an overdose prevention site in Portland where drugs could be used safely, with clean needles, a staff to respond to overdoses, and testing of drug contents. Simpson said he got the idea to stage a “die in” because they had been used to draw attention to victims of AIDS in the past. He did not know of other similar events related to overdose deaths in Portland. The idea to create a safe-injection site in Portland was first presented to city officials this past winter, by Jesse Harvey, founder of Journey House Sober Living, which operates three recovery houses in York County. Harvey also started Portland OPS, which helped organize Friday’s die-in. Rob Korobkin, a supporter of the overdose prevention site idea, said advocates would like to see the city council support and fund such a project. But if that doesn’t happen, the group is prepared to bring the issue to a city-wide referendum. Portland Mayor Ethan Strimling and State Rep. Benjamin Collings (D-Portland) both participated in the event. Some people, like Curtis, stopped and watched the entire event. Others stopped for shorter periods. Many took pictures of the participants as they lay on the ground, with their eyes closed. One of the participants was 12-year-old P.J. Lowry, whose mother, Merideth Norris, is a Kennebunk physician who treats addiction. “I hear a lot of jokes about drugs at my school and I tell people that’s so offensive,” said P.J. Courtney O’Brien of Sabattus had a headstone/sign that read “We are human.” She said she’s “lost a lot of people” to addiction. She thinks overdose prevention sites would prevent deaths. “We have tried the law and order solution and it isn’t working,” said O’Brien, 34.